Bus from KL to Kuantan is so called the best transportation option to travel from KL to Kuantan because there is no train service from KL to Kuantan and flight service is relatively inconvenient when comparing to taking bus. Besides, coaches are comfortable, offer cheaper fare, and are always convenient. LA Holidays, Mayang Sari, Transnasional, and Plusliner are some famous brands serving bus from KL to Kuantan. Locals favour the brands because of their departure punctuality and frequent bus schedules. LA Holidays goes beyond standard service by offering add-on services like USB charging point and WiFi service on board. Other bus operators with quality bus service but lesser bus schedules are Etika Express, Konsortium, Adam Express, Kesatuan Express, Maraliner, and Utama Express. The duration required for bus from KL to Kuantan takes about 3 to 3.5 hours depending on the traffic condition on Karak Highway. Washroom breaks will be provided upon request to the driver during the journey. The bus fare for bus from KL to Kuantan is around RM 23.00 to RM 25.00. The departure point in Kuala Lumpur for coaches going to Kuantan is at TBS (Terminal Bersepadu Selatan). The nearest LRT station is Titiwangsa Station of the Yellow LRT line. The arrival point in Kuantan is at the new bus terminal, Kuantan Sentral located at Indera Mahkota. LA Holidays also drops off passengers at Universiti Malaysia Pahang (UMP), which is convenient for students of the university. 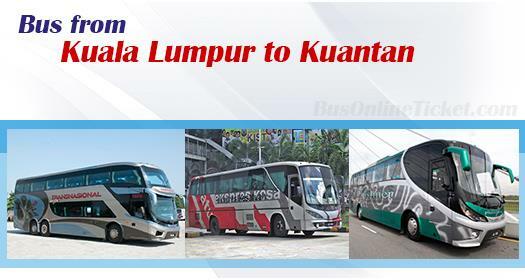 One can book online for bus tickets from KL to Kuantan in BusOnlineTicket.com, a reputable website which has launched the online booking service since 2007. Online booking KL to Kuantan Bus Ticket is convenient, cost-saving and hassle-free especially in Kuala Lumpur where traffics are heavy and parking fees are expensive. Besides that, travellers also save the time and cost needed to purchase tickets at a counter. Recently, BusOnlineTicket.com has also launched the offline cash payment option at Klang Valley 7-Eleven stores, which provides the convenience to non-credit card holder travellers.